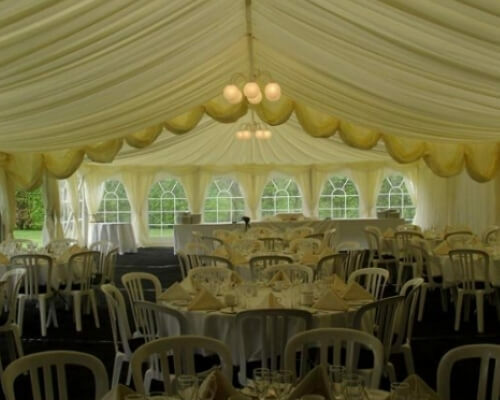 If you require marquee hire for any events in the Bridgnorth area, County Marquees can meet all your requirements, providing a wide range of marquees. Catering for any event, our team have several marquee styles and features available to fit in with the style of any event. Marquees are a great option for all weddings and parties and we can provide great value for money with our service. The marquees we provide are always of the highest quality and perfect for many weather conditions. We have several shapes and sizes available, tailoring each marquee perfectly for the number of guests at every event and the space you have available. Your requirements will be discussed well in advance, allowing us to guarantee the availability of marquees. We offer a wide range of marquees in Bridgnorth with various sizes available. Before your event, we will always discuss your requirements and the marquee sizes and styles that we have. This ensures the right marquee is always used for your event and any issues with lack of space are prevented. With width sizes of 30’, we supply lengths from as small as 10’ up to 100’. 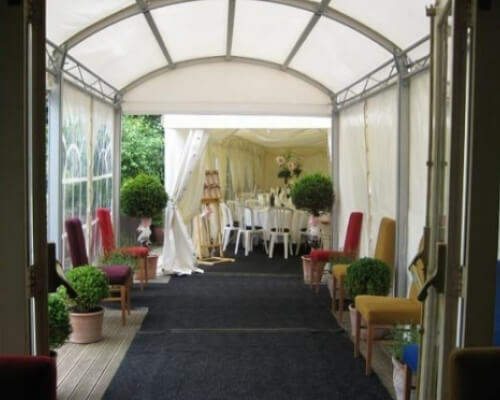 All marquees also have doors and windows, making it a perfect option for any weather. We can always discuss your furniture requirements, ensuring the entire interior is tailored to you and your requirements for the events. Our furniture will always help with seating your guests, with tables available to meet the needs of the largest parties. With all marquee hire, there is such a huge selection to choose from with your styles and we can always discuss your requirements well in advance and the range of features available. Whether you require small or large marquees, we can always adapt the style to suit your preferences. With lighting, lining and roofing options available, there are always different choices for our clients to tailor their marquee to the design you would like, perfect for your wedding or party venue. With flexibility in every style, you will always gain a sense of personalisation and freedom using marquee hire in Bridgnorth. County Marquees will speak to you regarding all the different features we have available and make sure that marquees are always available for the dates you require. In addition to lighting and the standard furniture we have available included in marquee hire, there are also many other features we can offer to personalise the marquee for your event. One of the features we have available are swags and roof swags. Swags droop within the marquee or over your roof and are available in a wide range of colours. Swags create a great style on any marquee and allows you to add colour to every marquee. We have several lighting options for our marquees and use high-quality lighting equipment to prevent any issues from occurring. Whether lighting is used for garden parties or required for the dance floor and night events, we can always provide you with specialist lighting. Whilst we have chandeliers available, our most popular option is using night skies to create extra mood effects. Light colours can always be changed to fit the mood of your event. Some of the other features we have includes our lining types. Our linings are pleated and ivory in colour which creates a great backdrop for any occasion. This lining colour can also be set off with the lighting and the swags you decide on. We also have black-out linings available which can create a starlight ceiling for a fun effect on every marquee. With a wide range of features available and complete choice on the size and style of your marquee, our marquee hire is a great option for any event. Bridgnorth is a small town in the county of Shropshire. With a small population of just over 12,000, it is a beautiful area to work throughout and somewhere we always look to provide our marquees. No matter what venue or land in Bridgnorth you choose to use, our marquee sizes ensure they can be used on a wide range of venues in this area. We are always happy to provide marquee hire in Bridgnorth for any client. Despite being a small town, Bridgnorth is still home to several fantastic landmarks and attractions. Whether you are a visitor or local, there is always a point of interest perfect for you. Just some of the landmarks located in Bridgnorth include Bridgnorth Castle Hill Railway, Bridgnorth Castle and Grounds, Dudmaston Estate, Bridgnorth Town Hall, Rays Farm and Daniels Mill. These are just some of the many attractions in Bridgnorth, with many other areas also available to visit. 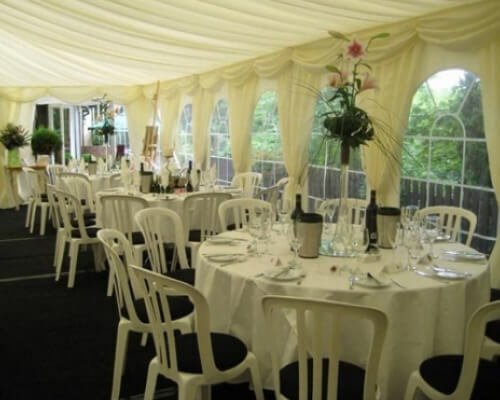 Since being established, our team have always provided marquee hire throughout the Bridgnorth area. We always offer a personal service to clients located here, discussing all your requirements for the event and marquee. We can always provide a quick response to any enquiries and with easy travel into the Bridgnorth area, marquees can be set up easily at your venue, well in advance before the marquee is actually needed. County Marquees always offer a personal service to make every event perfect for our clients. Marquee hire is a great addition to any party or wedding and with a huge selection of sizes ranging from 10’ to 100’, they can fit within any venue you host your event at. We will always discuss the details of your venue and ensure that the correct venue is always available to be used for the dates you require. With complete personalisation of our marquees, you can always choose between a range of styles to decide on what suits your event best. This allows a change of colours and features throughout the marquee. No matter what event you are holding, the marquee will be tailored to your specific requirements, perfect for the style of wedding or party you are hosting. We will provide a professional service, setting up your marquee as early as possible and laying out all furniture and features throughout the marquee. The marquee will be completely set up by the time you are ready to use it, with dance floors and any food you have organised ready for your guests. We help our clients from start to finish with preparation of the marquee and always give you the highest standard of service. If you would like to organise marquee hire or discuss any of the services that we have available, do not hesitate to contact our team. County marquees will provide advice and information regarding all our marquee styles and check the availability in Bridgnorth. Call us today on 07816648624 or 01214232662 or fill in our contact form to make an enquiry. 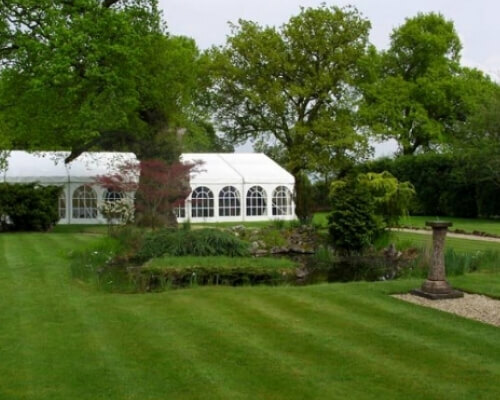 We provide exceptional marquee hire services across Stourbridge. We also offer our customers the very finest party marquees. Our wedding marquees can make your special day. We are committed to providing our customers the very best service.